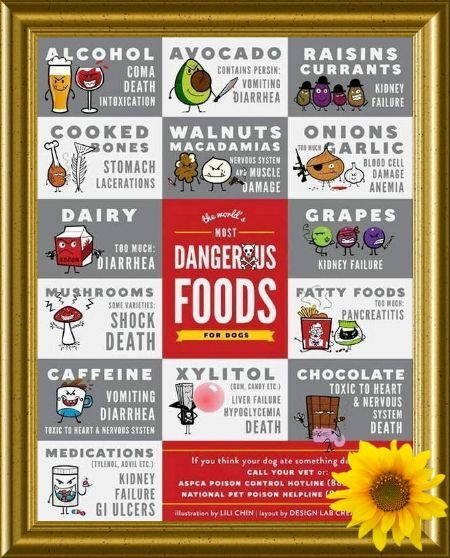 Did you know that many common foods that we eat everyday are in fact extremely unsafe for your dog? Sometimes they can even prove to be fatal for your Springer Spaniel as well. Over the years, I have come across a number of dog owners who are in the habit of sharing their table food with their dogs. Obviously not realising how harmful this can be? Instead of sharing your table dinner with your pet why not cook him some special nutritious lip smacking dog friendly recipes, right at home. Below are 10 items that might be favourites for us humans, but are harmful for your canine companion. ONION ~ Onions & Chives tend to destroy red blood cells causing anaemia, weakness & respiratory problems. Whether its raw, cooked or powdered, even a small quantity might prove to be fatal. GARLIC ~ Although not as harmful as Onions can be, Garlic can still prove to be injurious if taken in large amounts. Too much garlic intake may cause destruction of red blood cells causing anaemia , weakness & respiratory problems. GRAPES & RAISINS ~ Intake of even a single piece of grape or raisin might cause kidney failure in a dog. AVOCADOS ~ Avocado contains toxic material named 'Persin' than can harm your dog's heart, lungs & bodily tissues. Being high in fat, avocado intake might trigger of respiratory problems, severe vomiting stomach upset, indigestion & even Pancreatic problems. TOMATO ~ Tomatoes contain 'Tomatine', an alkaloid. Intake of tomatoes can cause weakness, lethargy, drooling, difficulty breathing, colic, vomiting, diarrhoea or constipation, widely dilated pupils, paralysis, heart problems, central nervous system disorders that include seizures & tremors. CHOCOLATE ~ Milk chocolate, dark chocolate or even plain chocolate ~ all are equally dangerous for your dog. Intake of even a small portion of dark chocolate can prove to be fatal for your dog. Chocolate can cause seizures, coma & death. WALNUTS ~ Accumulated fungi or moulds in walnuts are extremely dangerous. If a dog eats even a small amount, it might become ill & die. The visible symptoms of walnut poisoning are vomiting, trembling, drooling, lethargy, loss of appetite, blood-tinged stool or vomit & jaundice. FRUIT SEEDS ~ Seeds present in fruits like apple, cherry, peach, plum, apricots high in cyanide content. Large intake, especially thorough chewing of these seeds may cause direct cyanide intake which is dangerous. Apart from rice, large amount of whole grains may cause indigestion. Wild mushrooms can cause abdominal pain, liver damage, indigestion, diarrhoea , coma, or even death. Raw egg whites are high in protein called 'Avidin' that can cause hair loss, weakness, growth retardation, or skeleton deformity. Cooked bones can splinter, tear & rupture internal organs. NEVER give cooked bones to dogs! Whole vegetables like lettuce, carrots, beans, yams as they are difficult to digest. High fat containing dairy products that might cause diarrhoea or indigestion. Vets have strictly advised dog owners NOT to feed even the smallest amount of nutmeg to their dogs. Nutmeg is poisonous to them & causes tremors, seizures & death in canines. Caffeine stimulates the central nervous & cardiac systems, & can cause vomiting, restlessness, heart palpitations, & even death within hours. Macadamia nuts can cause weakness, muscle tremor & paralysis. Too much intake of salt, fat, ham, bacon or liver will cause disorders like kidney problems, bloating, pancreatitis, gas, indigestion, deformity of bones, weight loss & anorexia.